The Border Security Force (BSF) is the primary border defence organisation of India. It is one of the seven Central Armed Police Forces of the Union of India, it was raised in the wake of the 1965 War on 1 December 1965, "for ensuring the security of the borders of India and for matters connected there with". It is a Central Armed Police Force charged with guarding India's land border during peacetime and preventing transnational crime. It is a Union Government Agency under the administrative control of Ministry of Home Affairs. The BSF has its own cadre of officers but its head, designated as a Director-General (DG), since its raising has been an officer from the Indian Police Service. It is an Armed Force of the Union of India tasked with various assignments from time to time. The BSF has grown exponentially from a few battalions in 1965, to 186 battalions with a sanctioned strength of 257,363 personnel including an expanding air wing, marine wing, artillery regiments, and commando units. It currently stands as the world's largest border guarding force. BSF has been termed as the First Line of Defence of Indian Territories. The unique BSF Camel Contingent during the annual Republic Day Parade. A soldier of India's Border Security Force in one of the ceremonial uniforms. BSF soldiers contributing and supporting at a Medical Camp, India. From independence in 1947 to 1965, the protection of India's international boundaries was the responsibility of local police belonging to each border state, with little inter-state coordination. BSF was created as a Central government-controlled security force to guard all of India's borders, thus bringing greater cohesion in border security. BSF is charged with guarding India's land border during peacetime and preventing transnational crime. It is a Union Government Agency under the administrative control of the Ministry of Home Affairs. It is one of many law enforcement agencies of India. It currently stands as the world's largest border guarding force. During the Indo-Pakistani War of 1965, the border management system was in the hands of the individual state police forces, and these proved incapable of properly dealing with border threats. Following these episodes, the government created the Border Security Force as a unified central agency with the specific mandate of guarding India's international boundaries. K F Rustamji, from the Indian Police Service, was the first Director General of BSF. Till 1965 India's borders with Pakistan were manned by the State Armed Police Battalion. Pakistan attacked Sardar Post, Chhar Bet, and Beria Bet on 9 April 1965 in Kutch. This exposed the inadequacy of the State Armed Police to cope with armed aggression due to which the Government of India felt the need for a specialized centrally controlled Border Security Force, which would be armed and trained to man the International Border with Pakistan. As a result of the recommendations of the Committee of Secretaries, the Border Security Force came into existence on 1 Dec 1965 with K F Rustamji as its first Director General. The BSF's capabilities were used in the Indo-Pakistani War of 1971 against Pakistani forces in areas where the Regular Forces were thinly spread; BSF troops took part in several operations including the famous Battle of Longewala. In fact, for BSF the war on eastern front had started well before the war actually broke out in Dec '71. BSF had trained, supported and formed part of "Mukti Bahini" and had entered erstwhile East Pakistan before the actual hostilities broke out. BSF had played a very important role in Liberation of Bangladesh which Indira Gandhi and Sheikh Mujibur Rehman had also acknowledged. The BSF, long considered a male bastion, has now deployed its first batch of women personnel at the border to carry out regular frisking of women as well as other duties performed by their male counterparts, including guarding the border. Over 100 women have been deployed on the highly volatile Indo-Pak border, while around 60 will be deployed on the Indo-Bangla border. In total, 595 women constables will be deployed on the border in different phases. Mr K F Rustamji IPS was the first Director General of Border Security Force from 21 July 1965 to 30 September 1974 & current Director General is Mr Rajni Kant Mishra IPS, since 1st October 2018. 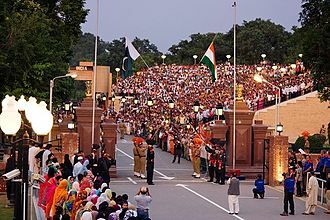 Every evening, at the Wagah border, which is the international border of India and Pakistan, the BSF together with the neighbouring country's border guarding, the Pakistan Rangers conduct a military drill while lowering the respective national flags. This attracts a good number of spectators from both countries, as well as international tourists. Similar parades are being organised at Mahavir/Sadqi border near Fazilka and Hussainiwala/Gandasinghwala border near Firozpur. Although originally charged with guarding India's external boundaries, the BSF has more recently been given the task in counter-insurgency and counter-terrorism operations in Jammu And Kashmir, Punjab, North East. While in Punjab BSF took Part in operations like Blue Star, Black Thunder 1 & 2 till 1989 and when the insurgency in Jammu and Kashmir broke out in 1989, the BSF handover the Counter Insurgency Operations to CRPF and Punjab Police and moved towards state of Jammu & Kashmir. In Jammu and Kashmir state police and the thinly-deployed Central Reserve Police Force (CRPF) struggled to cope up with the spiraling violence, and the Indian government deployed the BSF to Jammu and Kashmir to combat separatist militants. The BSF initially suffered casualties from insurgent attacks but later saw successes, including the arrest of militant leaders, after setting up an intelligence network and working with local civilians. BSF contribution in reducing militancy in J&K is widely acknowledged. The BSF killed Ghazi Baba—chief of Jaish-e-Mohammed and the mastermind of the 2001 Indian Parliament attack—in August 2003 along with his deputy commander. The BSF raided Baba's hideout in Srinagar and he was killed in the ensuing gun battle along with his deputy chief. Despite the BSF's success in a counter-terrorism role, many in the government felt that this additional burden was leading to a dilution of the BSF's mandate and degrading the force's ability to perform its primary role of guarding the country's borders. 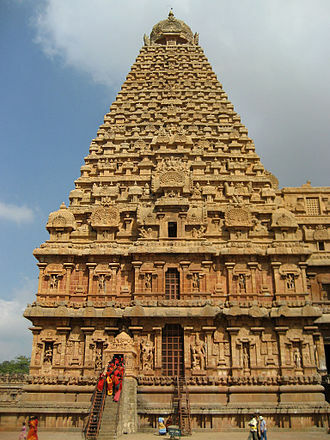 In 2006 the Indian government has decided to implement recommendations to restrict each security agency to its mandate. Thus the 16 BSF battalions in Jammu and Kashmir are gradually being withdrawn from counter-insurgency duties and diverted back to guard the Indo-Pak border. They are being replaced by fresh units from the CRPF that have undergone specialised training in counter-terrorism. But the CRPF is yet to take over sensitive places like Tral. The 16 battalions being withdrawn from J&K were supposed to provide R&R to the battalions already deployed on the border. But with increasing Naxal violence in Central India, the government decided to diversify the Anti-Naxal operation with the induction of ITBP and BSF. BSF was deployed in Kanker district of Chhattisgarh, where Naxal strength is comparatively thinner than that of other parts of Bastar region. At present total 15 battalions of BSF are stationed in different parts of Kanker district to combat the Naxal menace. 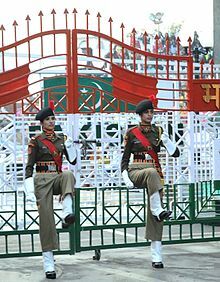 Women personnel of BSF taking part in the ceremonial retreat at the India-Pakistan border at Wagah, 2010. Border personnel from both countries, during the Wagah Border ceremony. The Border Security Force has its Headquarters at New Delhi and is known as Force Headquarters (FHQ) headed by a Director General. Various Directorates like Operations, Communications & IT, Training, Engineering, General, Law, Provisioning, Administration, Personnel, Armaments, Medical, Finance etc. function under the DG. Each Directorate is headed by an IG. The Eastern Theatre is looked after by Spl DG HQ at Kolkata and the Western Theatre is looked after by Spl DG HQ at Chandigarh. Field Formations in BSF are headed by an IG and are known as Frontiers Headquarters (FtrHQ). There is 10 such Frontier under which Sector Headquarters (SHQ) function headed by a DIG each. There are 31 such Sectors. Each SHQ has under its command 4–5 Duty Battalions. Presently 186 Battalions are sanctioned to BSF. Five major training institutions and 10 Subsidiary Training Centres (STCs) are imparting ab-initio as well as in-service training to its ranks and other CPOs/SPOs including IPS Probationers. BSF is the only Central Armed Police force to have its own Air Wing, Marine Wing and artillery regiments, which support the General Duty Battalions in their operations. The Financial Adviser of the BSF has been an Indian Revenue Service officer of the rank of Joint Secretary and also has Dy Advisers from the Indian Audit and Accounts Service and Indian Civil Account Service. The BSF also has a national level school for breeding and training of dogs. Dogs from other CPOs and State Police are sent to National Training Centre for Dogs (NTCD) to be trained in infantry patrol, detection of explosives, tracking and the like. 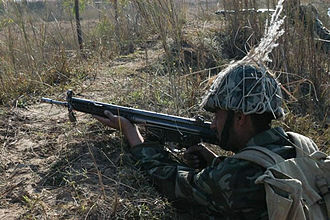 The BSF maintains a Tear Smoke Unit (TSU), which is unique in India. The TSU is responsible for producing tear gas munitions required for the Anti-Riot Forces. It also exports a substantial quantity to other countries. Three battalions of the BSF, located at Kolkata, Guwahati, and Patna, are designated as the National Disaster Response Force (NDRF). Each battalion maintains 18 self-contained specialist search and rescue teams of 45 personnel each, including engineers, technicians, electricians, dog squads and medics and paramedics. The establishment of each battalion is 1,158 personnel. The NDRF is a multi-disciplinary, multi-skilled, high-tech force for all types of disasters and can deploy to disasters by air, sea, and land. The battalions are equipped and trained for all natural disasters including combating Nuclear, Biological, and Chemical (NBC) disasters. To promote a sense of security among the people living in the border areas. To prevent trans-border crimes, unauthorized entry into or exit from the territory of India. To prevent smuggling and any other illegal activities on the Border. Holding ground in assigned sectors. 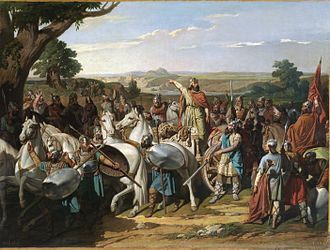 Maintenance of Law and Order in enemy territory administered under the Army's control. Guarding of Prisoners of War camps. Acting as guides to the Army in border areas. Assistance in control of refugees. The Cabinet Committee on Security (CCS) is considering a proposal to entrust the border-guarding duty along the Indo-Myanmar border to the Border Security Force (BSF). Presently, the 1,640 kilometres (1,020 mi) Indo-Myanmar border is being guarded by Assam Rifles. The proposed move to guard the Indo-Myanmar border follows a proposal from the BSF to take over the role by raising 45 new battalions, one headquarters of additional director general, four frontier headquarters to be headed by an IG rank official and 12 sector headquarters to be headed by DIG level officials. But the recent rise in Insurgent Activities on Indo-Myanmar Border has forced the Government of India to delay a Border Guarding Force like BSF on Indo-Myanmar Border. As of 1 March 2015, it was decided by the Ministry of Home Affairs to keep the authority of this border with Assam Rifles only. Being a central Indian police agency and having high presence of Indian Police Service officers, BSF follows ranks and insignia similar to other police organizations in India. *This rank structure may be equated to corresponding ranks in the defence forces. All the equipment including the uniforms, weapons, ammunition, vehicles such as the bullet proof vehicles, troop carriers, logistics vehicles, mine protected vehicles are manufactured indigenously at the Indian Ordnance Factories under control of the Ordnance Factories Board. Beretta MX4 Storm submachine guns. 68000 SMGs procured and replaced the SAF Carbine 1A. INSAS: 5.56 mm × 45 mm Assault Rifle. Service rifle of the force. FN FAL Completely phased out as the service rifle by the INSAS rifle but still used as a DMR. Tavor: X95 or the MTAR-21 version used as the standard issue carbine. Gun Machine 7.62 mm '1B' OFB Manufactured, modified 7.62 mm NATO Bren. India Tactical transport HS 748-100 2 As of 2009. Embraer 135 Brazil VIP transport Embraer-135 J 2 As of 2009. HAL Dhruv India Utility helicopter 8 As of 2009. Creek Crocodile Commando are the elite commando force of BSF. It is Rann of Kutch (an extensive salt marsh of western India and southeast Pakistan between the Gulf of Kutch and the Indus River delta. It was the scene of major border disputes in 1965 and 1971). Creek (Gujarat): In order to thwart landing of terrorists through the sea route, BSF has formed its first commando unit—Creek Crocodiles—to man the hostile creek area where India shares a border with Pakistan. Creeks are a very hostile terrain, constituting numerous raised grounds having mangroves and a network of water channels which are quite shallow where all movements are tide dependent. "Creek Crocodiles are trained to thwart any evil designs from across the border", BSF commandant Pushpendra Singh Rathore, who had created and trained the commando unit at Koteshwar outpost of BSF, said. "We have kept three things in mind while selecting cadets for the commando including swimming and marine diving performance, firing abilities and endurance to work in the rough creek,". The Crocodile units have 42 commandos at present[when?] and they are undergoing vigorous training, he said. According to the senior BSF officer, some MPVs have already been introduced in a number of BSF units along the border and more MPVs to be added in the coming years. Facing difficulty in guarding riverine sections of Indo-Pak border, the BSF has started installing Farheen LASER walls to fill the gaps which saw several breaches by militants from across the border. In 2010, some Canadian visa officials rejected the immigration application of a retired BSF soldier Fateh Singh Pandher, terming BSF a "notoriously violent paramilitary unit engaged in systematic attacks on civilians and responsible for torturing suspected criminals". This accusation did not go down well with the Indian government. The Indian External Affairs Ministry was asked by the Home minister to take up the issue with Canada. The Home ministry of India, as well as the Indian public in general and several of India's political parties, expressed outrage at this attack and called Canada's actions discriminatory and spurious, and their charges against the BSF as baseless and unproven. 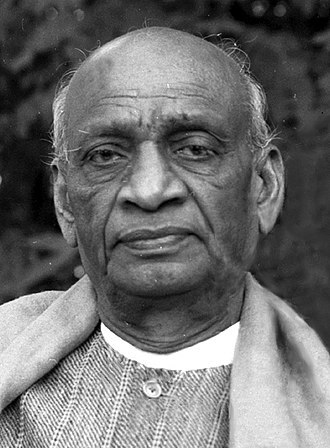 The Indian government threatened diplomatic retaliation unless Canada withdrew their allegations. The Canadian government did not respond immediately. It was speculated that diplomatic retaliation from India will consist of banning Canadians going to participate the War in Afghanistan if they are doing so through India. Public outrage in India prompted Canadian authorities to express "great respect for India's armed forces and related institutions". Subsequently, India's Ministry of External Affairs summoned Canadian High Commissioner Joseph Caron and demanded that "the blatant discrimination against Indian security agencies" cease. India's Minister of External Affairs, SM Krishna, condemned Canada's actions and has expressed pride in the accomplishments of the BSF. Following complaints made by the Indian government and criticism of Canada's actions against India, the Harper government retracted their earlier accusations against BSF security officials. Canada's Minister of Citizenship and Immigration, Jason Kenney, Termed as "unfortunate" the incidents involving use of "foul language by the Canadian High Commission in visa rejection letters to some individuals", Kenney said, "This language, or the inaccurate impression it has created, in no way reflects the policy or position of the Government of Canada." In July 2009 Channel 4 News reported that apparently "hundreds" of Bangladeshis and Indians are indiscriminately killed by the BSF along the Indo-Bangladeshi Barrier. The BSF claims that the barrier's main purpose is to check illegal immigration to India, and prevent cross-border terrorism from Islamists. Bangladeshi media accused the BSF of abducting 5 Bangladeshi children, aged between 8 and 15, from the Haripur Upazila in Thakurgaon District of Bangladesh, in 2010. The children were setting fishing nets near the border. In 2010, Human Rights Watch (HRW) issued an 81-page report which alleged "over 900 of abuses by the BSF" in the first decade of the 21st century. The report was compiled from interviews with victims of BSF shootings, witnesses and members of the BSF and its Bangladeshi counterpart. According to HRW, while most of them were killed when they crossed into Indian territory for indulging in cattle raiding or other smuggling activities. In February 2012, the BSF website was hacked by Bangladeshi hackers in retaliation. The hackers later shared the news in the internet and also in the other social sites where they claimed to have defaced the sites asking the BSF to stop killing Bangladeshis at border. The site became normal sometime on 15 February 2012. ^ "Border Security Force". Archived from the original on 24 December 2014. Retrieved 10 December 2014. 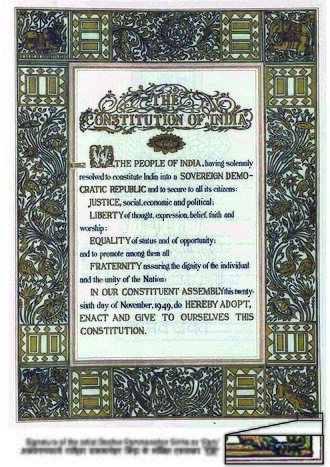 ^ Government of India (2 September 1968). "THE BORDER SECURITY FORCE ACT, 1968No. 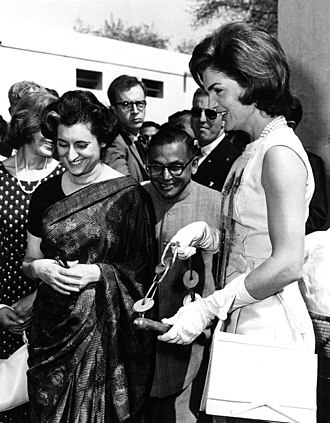 47 of 1968" (PDF) (in English and Hindi). MINISTRY OF LAW (Legislative Department ). pp. 1–2. Archived from the original (PDF) on 17 October 2014. Retrieved 8 September 2014. ^ a b Border Security Force. "ROLE OF THE BSF". Border Security Force, Ministry of Home Affairs. Border Security Force. Archived from the original on 8 September 2014. Retrieved 8 September 2014. ^ "BSF Air Wing". Border Security Force. Border Security Force. Archived from the original on 20 August 2014. Retrieved 8 September 2014. ^ "MHA Report 2016-2017" (PDF). Archived from the original (PDF) on 8 August 2017. ^ "BSF is first Wall of Defence of India, says Home Minister Rajnath Singh at 13th Investiture Ceremony". news.biharprabha.com. ANI. 22 May 2015. Archived from the original on 22 May 2015. Retrieved 22 May 2015. ^ a b "Border Security Force". bsf.nic.in. ^ "Raising Day: Six facts you should know about the exceptional Border Security Force Of India – Guarding India since 1965". The Economic Times. ^ "Border Security Force -Photo Gallary(Civic)". bsf.nic.in. Archived from the original on 26 July 2016. ^ "Border Security Force". bsf.nic.in. Archived from the original on 24 December 2014. ^ "sb.bsf.gov.in". Archived from the original on 20 November 2014. Retrieved 11 November 2014. ^ "Indian Ordnance Factories: OFB in Brief". Archived from the original on 8 February 2015. Retrieved 11 November 2014. ^ "Anti-material rifle handed over to BSF". The Hindu. Chennai, India. 15 February 2008. Archived from the original on 26 June 2010. Retrieved 13 October 2009. ^ a b c d S. Anandan (12 April 2009). "BSF buys 8 Dhruv helicopters". The Hindu. Archived from the original on 19 October 2015. Retrieved 2 December 2014. ^ "10 BSF Personnel Killed As Aircraft Crashes Near Delhi Airport". 22 December 2015. ^ Chethan Kumar (9 January 2015). "IAF gets first overhauled Su-30 MKI". The Times of India. Archived from the original on 10 January 2015. Retrieved 11 January 2015. ^ "Two new Mi-17 helicopters to bolster BSF air wing". Zee News. 29 July 2014. Archived from the original on 11 February 2015. Retrieved 2 December 2014. ^ "Choppers, anti-mine vehicles new teeth for BSF". The Times of India. 18 January 2011. ^ "BSF putting laser wall to fill gaps along Indo-Pak border". indiatimes.com. Retrieved 25 July 2016. ^ "Canada calls BSF a 'violent paramilitary unit'". Hindustan Times. 21 May 2010. Archived from the original on 24 May 2010. Retrieved 21 May 2010. ^ Kumar, Vinay. "Terming BSF". Archived from the original on 8 October 2017. ^ "Canada Visa Application". Times of India. 28 May 2010. Archived from the original on 22 December 2016. Retrieved 29 May 2010. ^ "We have great respect for Indias armed forces -Canada". Times of India. 22 May 2010. Retrieved 29 May 2010. ^ "Visa row, India warns Canada of retaliation". CNN-IBN. Archived from the original on 13 October 2012. Retrieved 29 May 2010. ^ "Visa Row, India warns Canada". Deccanherald.com. Archived from the original on 17 October 2012. Retrieved 21 March 2013. ^ "Canada regrets language used by its officials in visa letters". The Hindu Business Line. Archived from the original on 17 March 2014. Retrieved 29 May 2010. ^ "BSF killed 136 Bangladeshis since 2009". Retrieved 11 November 2014. ^ India says 59 killed over last six months on Bangladesh border Archived 26 October 2008 at the Wayback Machine, Reuters, 24 August 2008. ^ "Fortress India – By Scott Carney, Jason Miklian, and Kristian Hoelscher". Foreign Policy. Archived from the original on 28 March 2013. Retrieved 21 March 2013. ^ "Channel 4 News". 24 July 2009. Archived from the original on 28 December 2009. ^ "BSF abducts 5 children from border". The Daily Star. 24 July 2010. Archived from the original on 26 July 2010. Retrieved 24 July 2010. ^ "India/Bangladesh: Indiscriminate Killings, Abuse by Border Officers". Human Rights Watch. Archived from the original on 23 January 2011. Retrieved 21 January 2011. ^ "Bangladesh group hacks BSF website to 'avenge border killings' – The Times of India". The Times of India. 15 February 2012. ^ "বেপরোয়া বিএসএফ : ২৪ ঘণ্টার ব্যবধানে চাঁপাই সীমান্তে আরও দুই বাংলাদেশীকে হত্যা". আমার দেশ. Archived from the original on 11 November 2014. Retrieved 11 November 2014. Wikimedia Commons has media related to Border Security Force. Border controls are measures taken by a country to monitor or regulate its borders. Border controls are put in place to control the movement of people, specialized government agencies are usually created to perform border controls. Such agencies may perform various functions such as customs, security, official designations and command structures of these agencies vary considerably. In some countries, controls may be targeted at the national origin or other countries that have been visited. Others may need to be certain the traveler has paid the fees for their visas and has future travel planned out of the country. Yet others may concentrate on the contents of the travelers baggage, sometimes border controls exist on internal borders within a sovereign state. For example, in the Peoples Republic of China, there are border controls at the borders among the mainland, all persons need to present their passports or other types of travel documents to cross the border. For example, Hong Kong Permanent Identity Card and Home Return Permit are required for Hong Kong Permanent Residents who are Chinese citizens to cross the border, another example is the Malaysian states of Sabah and Sarawak, each having separate border controls from the rest of Malaysia. The forces operate under their own separate chains of command and wear distinct uniforms. Rangers are formally supervised by Special Security Unit, National Crises Management Cell, in the federal Ministry of Interior, the Force is governed by Rangers Ordinance 1959. The origins and roots of Rangers dates back to 1942, when the British government established a unit as the Sindh Police Rangers. Because the Rangers were neither correctly structured nor outfitted for a duty, in 1958. In 1972 following the Legal Framework Order No,1970, the force was renamed from the West Pakistan Rangers to Pakistan Rangers and given under the control of Federal Government. In 1974, it part of the Civil Armed Forces under the Ministry of Interior. In late 1989, due to growing riots and worsening Law and Order situation in Sindh, the force operated under the name of Mehran Force and included the existing Sindh Rangers,3 Battalions of Pakistan Army, Northern Scouts. Mehran force was under the command of Director General Pakistan Rangers with its nucleus Headquarters in Karachi. Subsequently the Federal Government decided to increase the strength of Rangers. Consequently,1 July 1995 the Pakistan Rangers were bifurcated into two forces, the Pakistan Rangers and Pakistan Rangers. The Mehran Force and other units operating in the province of Sindh were merged into the Pakistan Rangers. The Rangers had fought together with the Pakistan Army in several conflicts, Pakistan Rangers guard the borders during peace and war. In 1995, the Mehran Force was merged into the Pakistan Rangers, the Pakistan Rangers are credited for providing the Pakistan Army troops for Special Police Units in Kosovo and Haiti Peace mission every year. The Rangers had participated in special military operations along with Pakistan Army Special Forces branch in the past. Since their revitalisation and re-building after the 1971 war, the Rangers have been involved in the special military operations in Pakistan. The Rangers have assisted the Armys Special Service Group in performing special operations and they first participated in 1973, when they, based on the intelligence reports, had successfully accompanied the SSGs to raid the Iraqi Embassy. The Indian Police Service or IPS, is one of the three All India Services of the Government of India. It has replaced the Indian Imperial Police in 1948, a year after India gained independence from Britain, the service is not a force itself but provides leaders and commanders to staff the state police and all-India Central Armed Police Forces. Its members are the officers of the police. The Bureau of Police Research and Development is responsible for research, in 1861, the British Government introduced the Indian Councils Act of 1861. The act created the foundation of a modern and professionalised police bureaucracy in India and it introduced, a new cadre of police, called Superior Police Services, known as the Indian Imperial Police. The highest rank in the service was the Inspector General, in 1902-03, a Police Commission was established for the Police reforms under Sir Andrew Frazer and Lord Curzon. It recommended the appointment of Indians at officer level in the police, Indians could rise only to the ranks of Inspector of Police, the senior N. C. O. 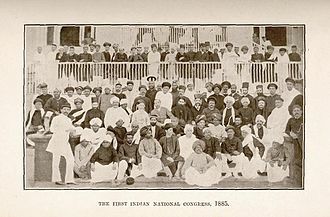 However they were not part of Indian Imperial Police, from 1920, Indian Imperial Police was open to Indians and the entrance examination for the service was conducted both in India and England. Prior to Independence, senior police officers belonging to the Imperial Police were appointed by the Secretary of State on the basis of a competitive examination. The first open civil service examination for admission to the service was held in England in June 1893 and it is not possible to pinpoint an exact date on which the Indian Police came formally into being. 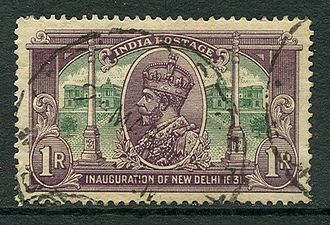 In this sense,1907 could be regarded as the starting point, in 1948, a year after India gained independence, the Imperial Police was replaced by IPS. In 1972, Kiran Bedi joined the IPS, becoming the first woman police officer, as per media reports in 2016, there is massive shortfall of IPS officers in India, which is nearly 19% to 22% of total strength. Historically, few officers have been awarded United Nations Medal and have participated in Indian Army United Nations peacekeeping missions, the Indian Police Service is not a force itself but a service providing leaders and commanders to staff the state police and all-India Central Armed Police Forces. The Central Reserve Police Force is the largest of Indias Central Armed Police Forces. It functions under the aegis of Ministry of Home Affairs of the Government of India, the CRPFs primary role lies in assisting the State/Union Territories in police operations to maintain law and order and counter insurgency. It came into existence as the Crown Representatives Police on 27 July 1939, after Indian Independence, it became the Central Reserve Police Force on enactment of the CRPF Act on 28 December 1949. Besides Law and Order and counter-insurgency duties, the role of CRPF in the General Elections, held repeatedly during the past few years, has very significant. This is especially true for the states of Jammu and Kashmir, Bihar. During the Parliamentary elections of September 1999, the CRPF played a role in the security arrangements. Of late, CRPF contingents are being deployed in UN missions, with 235 battalions and various other establishments, the CRPF is considered Indias largest paramilitary force and has a sanctioned strength of 308,862 personnel. The CRPF was derived from the CRP on 27 July 1939 with 2 battalions in Nimach and its primary duty at the time was to protect the British residents in sensitive states of India. In 1949, the CRP was renamed under the CRPF Act, during the 1960s, many state reserve police battalions were merged with the CRPF. The CRPF has been active against foreign invasion and domestic insurgency, on 21 October 1959, SI Karam Singh and 20 soldiers were attacked by the Chinese Army at Hot Springs in Ladakh resulting in 10 casualties. Since then,21 October is observed as Police Commemoration day nationwide, the CRPF guarded the India-Pakistan Border until 1965, at which point the Border Security Force was created for that purpose. On 2001 Indian Parliament attack the CRPF troopers killed all five terrorists who had entered the premises of the Indian Parliament in New Delhi, the Jawans fought bravely and thwarted the evil designs of the terrorists and successfully eliminated all of them on the spot. Shri Vijeto Tinyi, AC and Shri Dharambir Singh, Head Constable, in recent years, the Government of India has decided to follow up on recommendations of the Indian cabinet to use each security agency for its mandated purpose. The operation had two components—Operation Metal, confined to the Harmandir Sahib complex, and Operation Shop, which raided the Punjabi countryside to capture possible suspects. Following it, Operation Woodrose was launched in the Punjab countryside where Sikhs, specifically those carrying a kirpan, the operation was carried out by Indian Army troops with tanks, helicopters, armoured vehicles and tear gas. Casualty figures of Operation Blue Star given by Kuldip Singh Brar put the number of deaths among the Indian army at 83 dead and 249 injured, in addition, there were allegations that the CBI seized historical artefacts and manuscripts in the Sikh Reference Library, before burning it down. The military action led to an uproar amongst Sikhs worldwide and the increased tension following the action, many Sikh soldiers in the Indian army mutinied, many Sikhs resigned from armed and civil administrative office and several returned awards and honours they had received from the Indian government. Four months after the operation, on 31 October 1984, Indira Gandhi was assassinated by Satwant Singh, more than 8,000 Sikhs were killed in the ensuing anti-Sikh riots in 1984. The main political aim for Jarnail Singh Bhindranwale and the followers he was associated with during June 1984 was to pass the Anandpur Resolution, throughout his career Jarnail Singh Bhindranwale remained in contact with Indira Gandhi. Bhindranwale had earlier taken residence in Harmandir Sahib and made it his headquarters on, nirankaris Baba Gurbachan is alleged to have ridiculed 10th Guru Gobind Singh in a Nirankari Convention held in Amritsar. This prompted Akhand Kirtani Jatha to protest against Baba Gurbachan, in 1982, Bhindranwale and approximately 200 armed followers moved into a guest-house called the Guru Nanak Niwas, in the precinct of Harmandir Sahib. From here he met and was interviewed by television crews. By 1983, Harmandir Sahib became a fort for a number of rebels. On 23 April 1983, the Punjab Police Deputy Inspector General A. S.
Atwal was shot dead as he left the Harmandir Sahib compound, the following day, after the murder, Harchand Singh Longowal. Harmandir Sahib compound and some of the houses were fortified. The Statesman reported on 4 July that light machine guns and semi-automatic rifles were known to have brought into the compound. Faced with imminent army action and with the foremost Sikh political organisation, Shiromani Akali Dal, abandoning him, there are many hunters after it. Time magazine described Amritsar in November 1983, These days it more resembles a city of death. Inside the temple compound, violent Sikh fanatics wield sub-machine guns, the security men keep a nervous vigil, all too aware that the bodies of murdered comrades often turn up in the warren of tiny streets around the shrine. On 15 December 1983, Bhindranwale was asked to move out of Guru Nanak Niwas house by members of the Babbar Khalsa who acted with Harcharan Singh Longowals support. According to the Indian government, Operation Blue Star was launched to eliminate Jarnail Singh Bhindranwale, the armed Sikhs within the Harmandir Sahib were led by Jarnail Singh Bhindranwale and former Maj. He was fortunate in that an Indian Air Force forward air controller was able to secure and direct aircraft in support of the posts defence until reinforcements arrived six hours later. By the last week of November 1971, the Indian Army had launched offensive manoeuvres at Atgram against Pakistani border posts, the Mukti Bahini launched an offensive on Jessore at this time. It was clear to Islamabad by this time that open conflict was inevitable, yahya Khan chose at this point to try to protect Pakistans integrity and to hold India by Ayub Khans strategy – The defence of East Pakistan lies in the West. 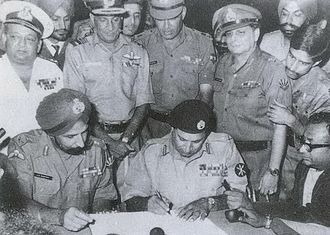 To this end, Gen Tikka Khan had proposed an offensive into India, to support Khans troops, the PAF had launched pre-emptive strikes on the evening of 3 December that led to the formal commencement of hostilities. The fall of Rahim Yar Khan to Indian forces would cut off the rail as well as link between Sindh and Punjab, starving Khans forces of fuel and ammunitions delivered to Karachi. However, these failed to pass on information on the Longewala post which. Longewala formed a point en route to capturing vast tracts of land. 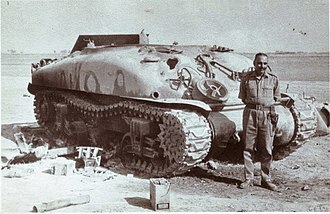 Pakistans tactical plan was based on the assumption that an attack in the area would help Pakistan’s 1st Armoured Divisions task in the Sri Ganganagar area. Pakistan High command felt that it was important to protect the North-South road link which they felt was vulnerable as it was close to the border, a Combined Arms Plan was decided upon. 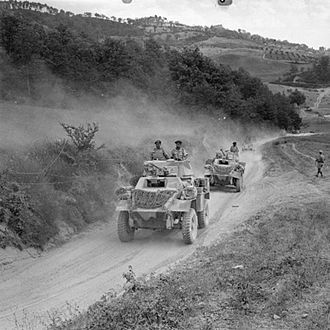 This involved two Infantry Brigades and two Armoured Regiments, a separate division, the 18 Division, was formed for this purpose. The Pakistani plan was to reach Longewala and Jaisalmer, the post was surrounded by a barbed wire fence of three stands. The rest of the battalion was located at Sadhewala,17 km north-east of the Longewala post, Chandpuri commanded an infantry company reinforced by a section each of MMGs and L16 81mm Mortar, and one Jeep-mounted RCL. His two other recoilless rifle teams of the section were under training at the battalion headquarters. Major Chandpuri had under his command a team of the camel Border Security Force division. The Indian Armed Forces are the military forces of the Republic of India. It consists of three professional uniformed services, the Indian Army, Indian Navy, and Indian Air Force, the President of India is the Supreme Commander of the Indian Armed Forces. The Indian Armed Forces are under the management of the Ministry of Defence of the Government of India, with strength of over 1.4 million active personnel, it is worlds 3rd largest military force and has the worlds largest volunteer army. India honours its armed forces and military personnel annually on Armed Forces Flag Day,7 December, Armed with nuclear triad, the Indian armed forces are steadily undergoing modernisation, with investments in areas such as futuristic soldier systems and missile defence system. The Department of Defence Production of the Ministry of Defence is responsible for the production of equipment used by the Indian Armed Forces. It comprises the 41 Indian Ordnance Factories under control of the Ordnance Factories Board and 8 Defence PSUs namely, HAL, BEL, BEML, BDL, MDL, GSL, GRSE and Midhani. India was the largest importer of defence equipment in 2014 with Russia, France, the Government of India has launched Make in India initiative to indigenise manufacturing and reduce dependence on imports, including defence imports and procurement. 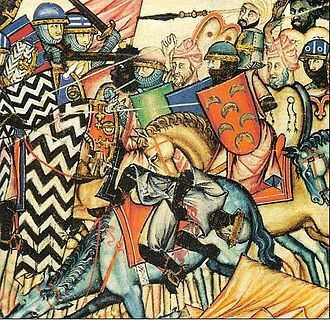 India has one of the longest military histories, dating back several millennia, the first reference of armies is found in the Vedas as well as the epics Ramayana and Mahabaratha. Classical Indian texts on archery in particular, and martial arts in general are known as Dhanurveda, Indian maritime history dates back 5,000 years. The first tidal dock is believed to have built at Lothal around 2300 BC during the Indus Valley Civilisation. 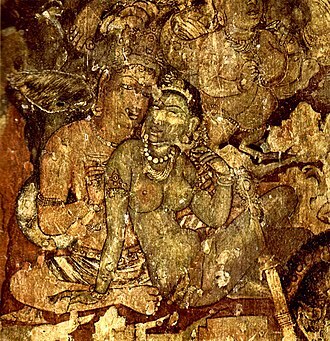 The Rig Veda written around 1500 BC, credits Varuna with knowledge of the routes and describes naval expeditions. There is reference to the wings of a vessel called Plava. A compass, Matsya yantra was used for navigation in the fourth and fifth century AD, the earliest known reference to an organisation devoted to ships in ancient India is to the Mauryan Empire from the 4th century BC. The Pakistan Armed Forces are the military forces of Pakistan. They are the sixth largest in the world in terms of military personnel. The armed forces comprise three main service branches – Army and Air Force – together with a number of paramilitary forces and the Strategic Plans Division Force. Chain of command of the military is organized under the Chairman of Joint Chiefs of Staff Committee alongside chiefs of staff of the army, all of the branches work together during operations and joint missions under the Joint Staff Headquarters. Since the 1963 Sino-Pakistan Agreement, the military has had close relations with China, working jointly to develop the JF-17, the K-8. As of 2013, China was the second-largest foreign supplier of equipment to Pakistan. Both nations cooperate on development of nuclear and space technology programs and their armies have a schedule for organizing joint military exercises. The military maintains relations with the United States, which gave Pakistan major non-NATO ally status in 2004. Pakistan gets the bulk of its equipment from local domestic suppliers, China. The armed forces were formed in 1947 when Pakistan became independent from the British Empire, the need for border management led to the creation of paramilitary forces to deal with civil unrest in the North-West and security of border areas in Punjab and Sindh by paramilitary troops. The armed forces have a pool of volunteers so conscription has never been needed, though the Pakistani constitution. The Pakistan Armed Forces are the best-organized institution in Pakistan, and are respected in civil society. Since the founding of Pakistan, the military has played a key role in holding the state together, promoting a feeling of nationhood and providing a bastion of selfless service. In addition, the Pakistan Armed Forces are the largest contributors to United Nations peacekeeping efforts, other foreign deployments have consisted of Pakistani military personnel serving as military advisers in African and Arab countries. Counter-terrorism strategies include attempts to counter financing of terrorism. If terrorism is part of an insurgency, counter-terrorism may employ counter-insurgency measures. Harcourt envisioned a permanent unit dedicated to the prevention of politically motivated violence through the use of techniques such as undercover infiltration. This pioneering branch was the first to be trained in counter-terrorism techniques and its name was changed to Special Branch as it had its remit gradually expanded to incorporate a general role in counterterrorism, combating foreign subversion and infiltrating organized crime. Law enforcement agencies, in Britain and elsewhere, established similar units, Counterterrorism forces expanded with the perceived growing threat of terrorism in the late 20th century. Most counter-terrorism strategies involve an increase in police and domestic intelligence. The central activities are traditional, interception of communications, and the tracing of persons, new technology has, expanded the range of military and law enforcement operations. Domestic intelligence is often directed at specific groups, defined on the basis of origin or religion, mass surveillance of an entire population raises objections on civil liberties grounds. Homegrown terrorists, especially lone wolves are often harder to detect because of their citizenship or legal status, good intelligence is at the heart of such preparation, as well as political and social understanding of any grievances that might be solved. Counterintelligence is a challenge with the security of cell-based systems, since the ideal. Financial tracking can play a role, as can communications intercept, in response to the growing legislation. United Kingdom The United Kingdom has had anti-terrorism legislation in place for more than thirty years, the Prevention of Violence Act 1939 was brought in response to an Irish Republican Army campaign of violence under the S-Plan. This act had allowed to expire in 1953 and was repealed in 1973 to be replaced by the Prevention of Terrorism Acts a response to the Troubles in Northern Ireland. Example of a passport, the travel document most commonly required to clear border controls. Quarantine operations deployed by mainland Chinese border control. As a border security measure, some jurisdictions in the west (such as Germany and Israel) have historically stamped denied entries on passports. This stamp was issued by Israeli authorities at the Taba Border Crossing (and misspells the English word "entry"). Bangladesh Last House, in the Bangladesh–India border at Jointa Hill Resort, Tamabil, Sylhet. A Pakistani Ranger- Punjab at the Wagah border. Ranger guarding the Tomb of Muhammad Iqbal in Iqbal Park, Lahore, Punjab, Pakistan. Yamam, one of Israel's counterterrorism units. Coast Guard on counterterrorism patrol in Upper New York Bay. Verrazano-Narrows Bridge in distance spanning The Narrows between Brooklyn (left) and Staten Island (right). Shayetet 13, the Israeli naval special forces. Italian howitzers used by the Mujib Battery; now preserved at the Bangladesh Military Museum. 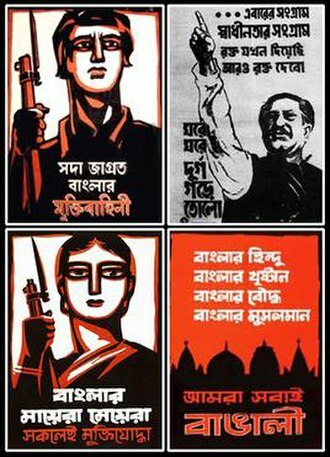 Mukti Bahini propaganda posters, one referencing Sheikh Mujibur Rahman's 7th March speech and calling all Bengali Muslims, Christians, Buddhists and Hindus to unite as one nation. 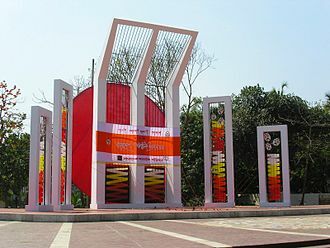 Aparajeyo Bangla (Invincible Bengal) was finished on 16 December 1978 by Syed Abdullah Khalid at University of Dhaka Campus, is a Monument to Mukti Bahini.